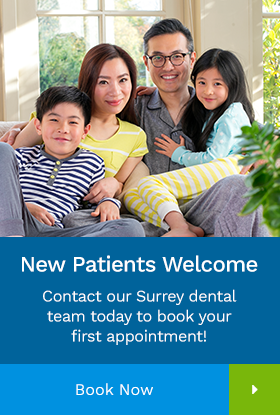 A beautiful, healthy smile that lasts a lifetime is our ultimate goal when treating our Elgin and Surrey patients, and that starts at home with a thorough brushing and flossing routine. Your personal home care starts by eating balanced meals, reducing the number of snacks you eat, and correctly using the various dental tools and aids that help control the plaque and bacteria that cause dental disease. Proper brushing and flossing can enhance the health of the mouth, make the smile sparkle and prevent serious diseases. Prevention of tooth decay – Tooth decay occurs when the acids found in plaque erode the natural enamel found on the teeth. This phenomenon can easily be prevented by using proper home hygiene methods. Prevention of periodontal disease – Removing plaque and calculus (tartar) from the surface of the tooth using a toothbrush, and from the interdental areas using dental floss, is an excellent way to stave off periodontal problems. Prevention of halitosis – Food particles can be removed with regular brushing and flossing; leaving the mouth healthier, and breath smelling fresher. Prevention of staining – The more regularly staining agents are removed from the teeth using brushing and flossing techniques, the less likely it is that the stains will become permanent. The teeth should be brushed at least twice a day; ideally in the morning and before bed. The perfect toothbrush is small in size with soft, rounded-end bristles and no more than three months old. The head of the brush needs to be small enough to access all areas of the mouth, and the bristles should be soft enough so as not to cause undue damage to the gum tissue. Flossing is a great way to remove plaque from the interdental regions. Flossing is an especially important tool for preventing periodontal disease and limiting the depth of the gum pockets. The interdental regions are difficult to reach with a toothbrush and should be cleansed with dental floss on a daily basis.